Kirsten is on a mission. She wants to show both young girls and mature women that style is ageless and that they shouldn’t be afraid to just try out new things and that fashion is fun. That is one reason she set up her blog LIFB where she shares her interests in lifestyle, interior, fashion and beauty. Let’s find out what inspires her! I live in a small town in rural Germany. I’ve moved a bit, have lived in Egypt with my parents when I was a teen or in Munich and Duesseldorf with my husband Joerg. Joerg and I have been together for 26 years and live in a cute wooden house from Sweden (which sometimes leads to discussions in my town because it’s just not a house that you see very often here!). I studied English language/literature and media sciences and was also lucky to spend a semester in Cambridge, England. You can definately say that I’m a late bloomer, I did my A-levels through night school before I went to uni from which I graduated when I was in my mid 30s; I gained a second university degree in 2010 as a PR consultant. Great Britian is my love, our house is stuffed with English speaking DVD’s and books, we even have a second dish so that we can watch English TV. I’m a freelance PR consultant but have to say that blogging starts to play a bigger and bigger role (which is a great thing!). Of course, I don’t have any problems sharing my age: I’ll be turning 44 in March but have to say I don’t feel like that at all! Can you tell us a bit more about your blog LIFB and why you created it? First of all I really have to thank Joerg! It’s down to him that I started blogging in the first place because he encouraged me. When I was still at university I started to read a lot of English interior magazines (I love the English country style – of course!) and engaged myself with lifestyle and so on, everything I personally loved and what made me happy. It has always been a dream of mine to be an editor of such a magazine. Well, you should never stop dreaming right? I’ve never really made my way into such a paper but love it to this day so one day Joerg said that I should start a blog with all the things I love. At first I had another blog but after about 9 months felt that there was something missing. So I started LIFB. This blog is about lifestyle, interior, fashion and beauty, in short LIFB. I love working on my blog and watch it develop. Joerg takes all my pictures and we mostly have a lot of fun together. My style is mostly very easygoing. Of course I love to put on heels but I’m not really a suit person, it’s not who I am. From a suit (I have one example in my blog where I’m wearing the complete suit which is very bold and looks fabulous) – I would only wear the trousers, skirt or jacket and combine it with something else. I’m probably more on the casual side with lots of classics that I love combining with It-pieces. 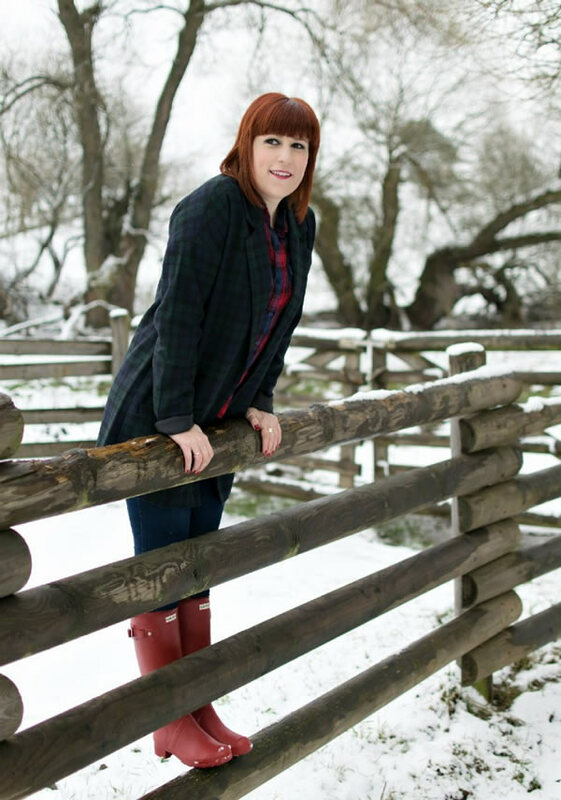 I would say that my style reflects me as a person; a pair of plaid trousers or a plaid jacket is something I love wearing. I love spicing it up with a great hat. I’m definately not a clean style person but more playful. Classics like a dufflecoat or a trench are a must for me but I love giving it a young look with great jeans, a pair of leather or plaid trousers. Hm, that’s not an easy one. Where I live now – no that doesn’t really incfluence me that much stylewise. Lots of blogs and magazines influence me and the stuff I love I try to adapt, even if it’s not so typical here. I live in Germany and we have the seasons (which I absolutely love) and you have to take that into account. Right now it’s cold and we need lots of warm coats and jackets. But I’m definately not a hot summer person. Maybe I had too much of that while I lived in Cairo. I prefer the cooler seasons. Great Britain has definately been a huge influence on me and because I’m so obsessed with plaid, it’s perfect. Lots of stuff I’m wearing is not standard in my small town but I don’t care. You find me wearing red over and over again, be it a coat, shoes, a bag, a hat – everything. It’s a colour I love and that is very me. Apart from that, as I mentioned earlier my style is more playful, probably some would say young with lots of classic pieces that I style up with trendy bits. I would definitely say the Modern English Country, Equestrian and Military Style, I’m obsessed with that. Some years ago Alexander McQueen had a stunning collection, Ralph Lauren also has some pieces I’m in love with (I don’t love all Ralph Lauren but the edgier stuff is gorgeous!). I could totally see myself living in an English Manor, having horses (although I don’t ride!) and wearing this style all day! What I probably also won’t ever tire of is the preppy look, it’s just too pretty. For sure. As an example I can only wear strong, more bold colours, I love pastels but can’t wear them. My skin is pale and pastels make me look even paler and sick. I often wear bodyhugging clothes but I’m not running around in shorts or crop tops. Never really have, it’s not my style. Still, I have to feel comfortable in my clothes and sometimes a long, wide blouse over a pair of skinny jeans looks stylish too. Oh, it sure has! I’m not scared to try things. For example: I bought my first hat when I was 42. Before that I thought I couldn’t wear them and now I can’t walk past hats. They are often the extra something! The internet especially has changed things for me. Sometimes I’m online for hours and hours until I find what I’m looking for and check where to get it. I’m more courageous today than I was years ago and don’t care when people look at me when I’m wearing my red Hunter boots (which are normal but not here!). But it’s still a process and it’s exciting. Can you imagine that I had to be in my 30s to start wearing heels? Here we go again: Late-bloomer! Quite frankly, I hate that term! To me it simply doesn’t exist! It’s ALL about the type, the personality, the body type and all. There aren’t any universal rules. Some fashion magazines show collages with outfit suggestions for a certain age. Whenever I look at the 40 section, I think that it doesn’t suit me at all, also colourwise. Everybody has to wear something that suits her best, find out the assets and accentuate exactly that. If someone has a cool style, she can still wear sweatpants and pumps in her 60s, I know someone who is 61 and dresses like a 30 year old and it’s so her, it looks fabulous, she pulls if off so perfectly. So much more which of course has to do a lot with my blog too! I love trying things and you should never stop trying because you can look stylish at any age. It most certainly expresses my personality. I’m an easygoing and lively person and this can be seen from what I’m wearing. Probably people know what to expect when they see how I dress. It’s so much fun for me to put together an outfit including hair and make up. Phew, I love all my outfits on my blog but in general I love the ones with a trench or dufflecoat the most, combined with a hat and this is me. I love to make a trenchcoat look stylish and not bourgeois (if that is the right term) by adding leather or something to make it look modern but classy at the same time. This is what the Modern English Country style to me is about, I love to explore that further. Last week we shot an outfit that I love so much and my husband said I looked like I was going hunting – I loved it! I do but I don’t follow everything. When neon colours were trendy, I passed, I had that in the 80s and that was that. In general I’m very open to trends though I must say often I’m not willing to spend lots of money on them. I want my investment pieces to be classics and I’m willing for pay more but not on hot trends. What I really love at the moment are the capes and ponchos, this is such a great trend and is something that I can easily adapt. Dear ladies, please never think because you’re 40+ you can’t look good or stylish anymore. On the contrary. You can change your whole appearance and take years off you depending on what you’re wearing. If you’re not sure what suits you, try to talk to a good friend or consult a coach (a friend of mine does that; she goes to people and checks their closets and goes shopping with clients who are not sure what suits them). I try not to think about my age too much, I love fashion and think if you wear something you love, it just shows. Of course my blog is a work in progress. I would love to make it a big online magazine for girls and women. Young girls should see that being 40, 50 and so on is not what it used to be. I want to encourage mature women that style is ageless and that they shouldn’t be afraid to just try things, that fashion is fun (and not everything has to be expensive or designer clothes). Show off your style and your lust for life with a smile – it’s how you will be perceived by your surroundings and it can have such a huge impact. It gives you confidence and makes you attractive, no matter how old you are. 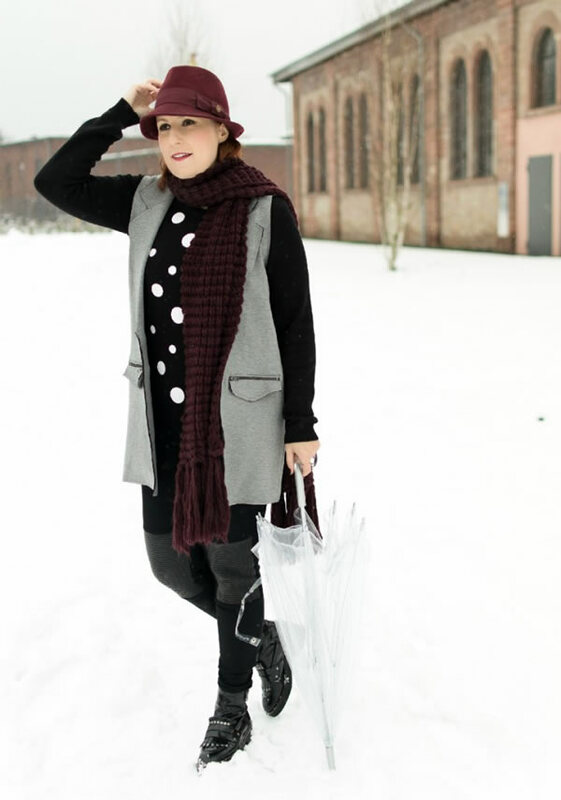 Be sure to check out Kirsten’s blog The LIFB issue to see more inspiring outfits! Thanks for introducing me to Kirsten. Very unique style and a great outlook on over 40 fashion. I love her fun, creative style. She’s got wonderful style (and hair!) Thanks for the introduction. I love Kristens style and I totally get her comment on looking at supposed age appropriate collages and thinking wow for one I am to small for theses styles and two they just dont speak to me. Kristen looks much younger than her age and her style not only helps with this but makes for exciting and fashionable outfits.I will definitely be checking out her blog. Cheers! What a great post Sylvia! Loved meeting a new very fresh face of fashion. Love her style!! A while ago Kirsten and I found out that we share this passion for the UK! We follow our blogs and social media and hopefully can meet some time soon. I love Kirsten’s unique style and all the little details about it. Great to see her here on 40+ Style, Sylvia! Sylvia, thank you for interviewing Kirsten! She strikes me as someone I would love to meet! Her blog concept sounds refreshing, and I love her style sense! Off to say hello now! Love the style, and the message, confidence and lust for life makes you attractive. Amen! Ah.. another blogger I can really relate to. I fully agree with her view on dressing over 40. I have even decided to keep the dress I bought which is risky short in my book (a hand above the knee). But it looks good with this one and my legs are my assets, so to hxll with so called rules. Great interview, great blogger that Kirsten. Love a lot of the photos shared of her. I am a fellow redhead and will be 45 later this year. Dealing with menopause and weight gain, have been a grandmother for 9 months now. I feel frumpy at best most days. This gives me hope. Previous post: 4 fabulous looks in blue and white – Which is your favorite? 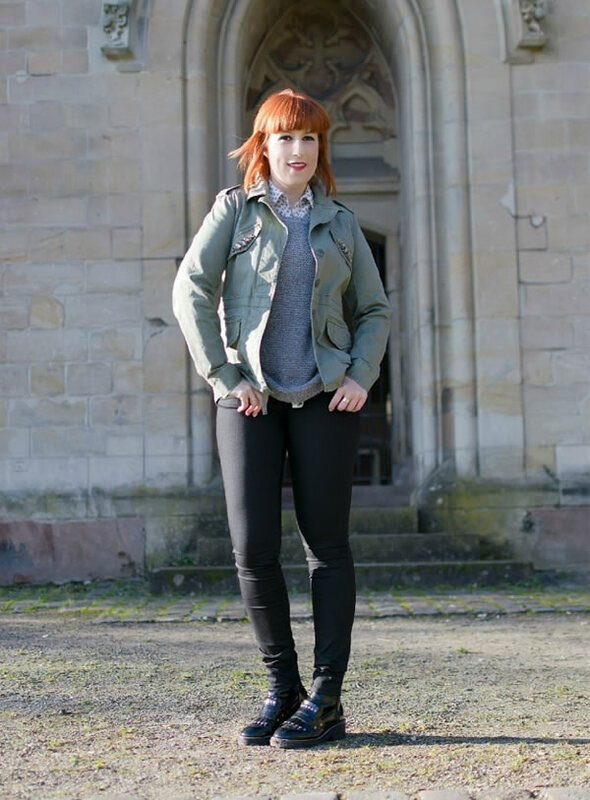 Next post: Brand focus: Trouvé – modern and youthful clothing that is easy to mix and match!